I think it would be safe to say that Emily may just be the biggest Fantasia fan I know. She loves the music and dances throughout the entire movie. Her favorite part of course is the Sorcerer's Apprentice. She hums this song over and over and even on occasion has made her dolls and siblings dance along. When we put up our Christmas tree last year, she was quite excited when we added the Sorcerer Mickey hat ornament to the tree. When you press the button, it even plays the melody from the movie. When we visited Disney's Hollywood Studios, as soon as she saw the Sorcerer's Hat icon in the park she excitedly yelled out, "It's Sorcerer Mickey!" and started loudly humming the tune and dancing along. As you will be able to see, this month's recipe is inspired by Emily's love of the Sorcerer's Apprentice segment of the movie Fantasia. 1. Melt the margarine and marshmallows in a large mixing bowl in the microwave. Cook for one minute then stir. Continue this until the marshmallows are completely melted. 2. Add several drops of blue food coloring to the marshmallow until it creates the blue you like for the hat. 3. Butter your hands and create cone shaped "Mickey Hats" with the treats. Place the cones on waxed paper. 4. Add the mini oreos (representing Mickey's ears) to each side. 5. 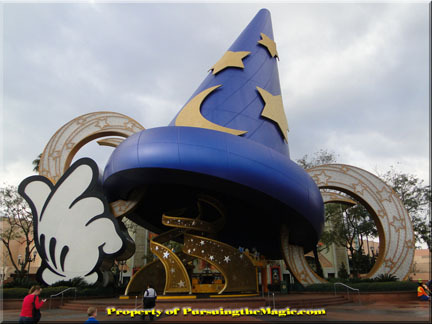 Randomly place the jumbo yellow star sprinkles on the cones to create Mickey's sorcerer hat. 6. Let the hats sit so they have a chance to set before serving. NOTE: I created the "cones," and my children decorated them. For older children, they would not have a problem creating these shapes before the marshmallow started to harden. Want to create a Mickey treat to remind you of your Mickey's Very Merry Christmas Party experiences? 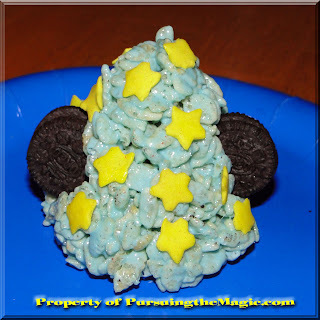 Dye the marshmallow green and add Mickey sprinkles to create miniature Disney Christmas trees. Create spheres, rather than cones, and you can decorate them to create Spaceship Earth. Yellow cylinders would be the perfect shape to create your own Monstropolis laugh canister. Impressive!! It turned out great, Beth!! Thank you! My kids loved decorating these!